Now accepting submissions for 2019 Journal (deadline 1 July 2019). Click here for further information and submission guidelines. For information and submission guidelines for the Young Scholars’ essay, click here. 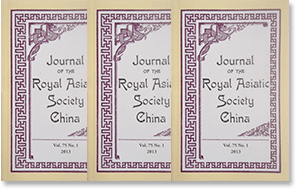 The Journal of the Royal Asiatic Society China is a continuation of the original scholarly publication of the North China Branch of the Royal Asiatic Society, the Journal of the North China Branch of the Royal Asiatic Society, published from 1858 to 1948. The Journal proudly maintains the level of academic standards and innovative research that marked its standing as the preeminent Western sinological journal in China for nearly a hundred years. The Journal publishes original research articles of up to 8,000 words (shorter articles are also welcome) on aspects of Asian culture and society, history, environment and current affairs, with a focus on mainland China. Original articles must be previously unpublished, and make a contribution to the field. The Journal also publishes timely reviews of books on all aspects of Chinese history, culture and society. For information about submissions, please click here. The RAS China in Shanghai series of China Monographs, published in association with Hong Kong University Press, are designed to reflect the vibrancy as well as the wide research interests and contacts of the Society and to provide a forum for its members and associates to publish their research interests. The Happy Hsiungs recovers the lost histories of Shih-I and Dymia Hsiung, two once highly visible, but now largely forgotten Chinese writers in Britain, who sought to represent China and Chineseness to the rest of the world. Shih-I shot to worldwide fame with his play Lady Precious Stream in the 1930s and became known as the first-ever Chinese stage director to work in the West End and on Broadway. Dymia was the first Chinese woman in Britain to publish a fictional autobiography in English in the 1950s. Through exhaustive research and fieldwork among surviving family members and friends, Diana Yeh traces the Hsiungs&#8217; lives from their childhood in Qing dynasty China and youth amid the radical May 4th era to Britain and the USA, where they became highly celebrated figures, rubbing shoulders with George Bernard Shaw, James M. Barrie, H.G. Wells, Pearl Buck, Lin Yu Tang, Anna May Wong and Paul Robeson among others. Though f├¬ted as &#8216;The Happy Hsiungs&#8217;, their lives ultimately highlight a bitter struggle in attempts to become modern. Dr Diana Yeh lectures at Birkbeck College, University of London and at the University of East London, UK. She has chapters in A. Robert Lee (ed. ), China Fictions/English Language: Essays in Diaspora, Memory, Story (Rodopi, 2008); M. Huang, (ed.) The Reception of Chinese Art across Cultures (Cambridge Scholars Publishing, forthcoming) and articles in journals such as the Critical Quarterly and Senses and Society. When the avant-garde writer Mu Shiying was assassinated in 1940, China lost one of its greatest modernist writers ,and Shanghai lost its most detailed chronicler of its demi-monde nightlife. As Andrew David Field argues, Mu Shiying advanced modern Chinese writing beyond the vernacular expression of May 4th giants Lu Xun and Lao She to reveal even more starkly the alienation of the cosmopolitan-capitalist city of Shanghai, trapped between the forces of civilization and barbarism. Each of these five short stories focuses on the author’s key obsessions: the pleasurable yet anxiety-ridden social and sexual relationships of the modern city and the decadent maelstrom of consumption and leisure in Shanghai epitomised by the dance hall and the nightclub. This study places his writings squarely within the framework of Shanghai’s social and cultural nightscapes. Andrew Field has a PhD in East Asian Languages and Cultures from Columbia University in 2001. He has since taught Chinese history and culture at several institutions in the United States, Australia, and New York University in Shanghai. He is currently working for Boston University in China. Field is the author of Shanghai’s Dancing World: Cabaret Culture and Urban Politics, 1919-1954 (Hong Kong: Chinese University Press, 2010) and of several articles on Republican Era and contemporary Chinese urban culture. Lao She remains revered as one of China great modern writers. His life and work have been the subject of volumes of critique, analysis and study. However, the four years the young aspiring writer spent in London between 1924 and 1929 have largely been overlooked. Dr Anne Witchard, a specialist in the modernist milieu of London between the wars, reveals Lao She’s encounter with British high modernism and literature from Dickens to Conrad to Joyce. Lao She arrived from his native Peking to the whirl of London’s West End scene – Bloomsburyites, Vorticists, avant-gardists of every stripe, Ezra Pound and the cabaret at the Cave of the Golden Calf. Immersed in the West End 1920s world of risqu├⌐ flappers, the tabloid sensation of England’s “most infamous Chinaman Brilliant Chang” and Anna May Wong’s scandalous film Piccadilly, simultaneously Lao She spent time in the notorious and much sensationalised East End Chinatown of Limehouse. Out of his experiences came his great novel of London Chinese life and tribulations – Ma & Son: Two Chinese in London. However, as Witchard reveals, Lao She’s London years affected his writing and ultimately the course of Chinese modernism in far more profound ways. Anne Witchard is Lecturer in the Department of English, Linguistics and Cultural Studies, University of Westminster. She is the author of Thomas Burke’s Dark Chinoiserie: Limehouse Nights and the Queer Spell of Chinatown (Ashgate Publishing, 2009) and co-editor with Lawrence Phillips of London Gothic: Place, Space and the Gothic Imagination (Continuum, 2010). Florence Ayscough – poet, translator, Sinologist, Shanghailander, avid collector, pioneering photographer and early feminist champion of women’s rights in China. Ayscough’s modernist translations of the classical poets still command respect, her ethnographic studies of the lives of Chinese women still engender feminist critiques over three quarters of a century later and her collections of Chinese ceramics and objets now form an important part of several American museum’s Asian art collections. Raised in Shanghai in an archetypal Shanghailander family in the late nineteenth century, Ayscough was to become anything but a typical foreigner in China.